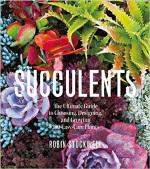 Robin Stockwell is the founder of Succulent Gardens, the legendary nursery in Castroville, CA. I've blogged extensively about their annual Succulent Extravaganza. 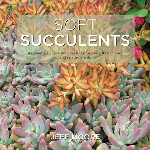 This book is a synthesis of his 30+ years of experience growing succulents. 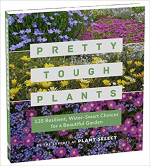 It combines hands-on information on planting and care with an encyclopedia of 203 of Robin's favorites. Other sections give design ideas for all kinds of gardens as well as DIY recipes for a variety of projects (wreaths, containers, table dressings, etc.). 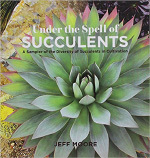 Jeff Moore, owner of Solana Succulents in Solana Beach, CA, is a leading succulent expert and poured his decades of knowledge into this oversized book. 800 photos of the highest caliber are crammed into 244 pages. Jeff self-published this labor of love in 2014 and it continues to be one of my favorite succulent books. You can buy it directly from him through his website. This is Jeff Moore's second self-published book. Under the Spell of Succulents (see above) set a milestone for print quality, and Aloes and Agaves in Cultivation raises the bar even higher. 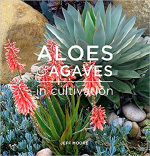 Over 1,000 amazing photos show aloes and agaves growing in cultivation in California. The book is a valuable source of information from an expert, and the beautifully reproduced photos will make you drool. My favorite succulent-themed book. This handy guide showcases 135 plants introduced over the last 20 years by Plant Select, a nonprofit collaboration of Colorado State University, Denver Botanic Gardens and professional horticulturists. Described as "resilient" and "water-smart," the plants are great additions to western gardens. 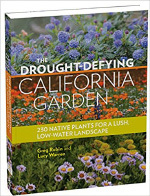 The Drought-Defying California Garden profiles 230 California natives that thrive in our climate where water is scarce. Instead of mixing them with non-natives, the authors recommend setting aside special areas where they can live in cooperative plant communities. In addition, the authors describe soil preparation (no fertilizers), irrigation (drip is not ideal), and care. On just 207 pages, this book covers a wealth of information, much of it new to me. Pam Penick, whose blog Digging I follow religiously, follows up her classic Lawn Gone! 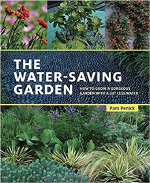 with a book packed with techniques for creating outdoor spaces that are as water-wise as they are beautiful. Profiles of seven water-saving gardens filled with plants adapted to life in hot and arid environments provide plenty of inspiration. This is followed by detailed information on the nitty gritty, including soil preparation, irrigation, and planting. Brief descriptions of 101 plants round out the book. You can use this heavy coffee table book both for weightlifting and for inspiration. 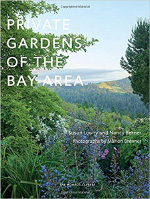 It showcases 35 private gardens spanning every style imaginable. Some are the realm of the 1% where space and money are no object. Others are more personal and intimate. I particularly liked the small but creative front gardens in San Francisco. I've actually visited a few of these gardens through the Garden Conservancy Open Days program but most will forever be off limits to me. Writer Johanna Silver and photographer Marion Brenner's sensitive tribute to the Ruth Bancroft Garden is as much about the people behind the garden—not just Ruth Bancroft herself but also the team making creative decisions now—as it is about the plants. Just like the garden, the book is a labor of love, and it shows. Many of us think of Japanese gardens as serene but rigid. This new book showcases the work of five leading landscape architects adapting traditional Japanese design principles to the unique characteristics of North America to create spaces connecting us to nature, even in the midst of a noisy city. The design styles range from classic to contemporary. 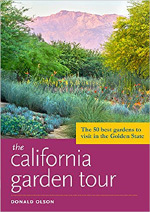 A must-have guide for any gardener living in or visiting California. Don Olson profiles 50 spectacular gardens open to the public, including well-known gardens like the Huntington and Lotusland as well as many I had never heard of before. 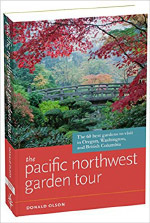 The Pacific Northwest version of Don Olson's Garden Tour books is essential for any PNW resident and visitor. I hope Don will continue to add to this immensely useful series. Published in 2014, this is a book I leaf through regularly. 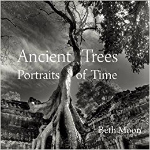 Beth Moon's 70 breathtaking black and white photos taken over a 14 year period on four continents capture the majestic beauty and mystery of ancient trees. Moon treats each tree as an individual—much like a portrait photographer would a person. These images are the perfect antidote to the relentless stress of everyday life. Jeff Moore's third self-published book will come out in December. It's at the top of my wish list. 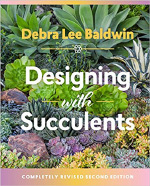 From Jeff Moore's website: "... a 300-page, 1000+ image look at all of the soft succulents that are so popular now – aeoniums, echeverias, dudleyas, crassulas, sedums, kalanchoes and more. This book is about plants in cultivation rather than habitat, with cultural tips and insights from a nursery owner with over 25 years of experience." 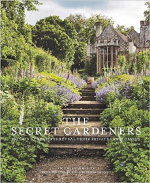 The Secret Gardeners is a lavish coffee table book showcasing the private gardens of 25 leading UK artists, including Andrew Lloyd Webber, Ozzy Osbourne, Sting, Terry Gilliam, and Julian Fellowes. This sounds like a wild ride through wildly different gardening styles. Victoria Summerley is a thoughtful writer, and I look forward to being taken inside these private spaces. A new book by Andrea Wulf is cause for celebration. I thoroughly enjoyed her previous books, Founding Gardeners: The Revolutionary Generation, Nature, and the Shaping of the American Nation and The Brother Gardeners: A Generation of Gentlemen Naturalists and the Birth of an Obsession (especially the latter). Wulf has a knack for making history come alive as if it were unfolding right now in front of our eyes. 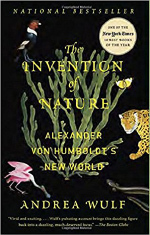 The Invention of Nature is a biography of Alexander von Humboldt (1769-1859), the most famous scientist of his age and yet all but forgotten. According to the cover text, "Andrea Wulf brings Humboldt’s extraordinary life back into focus: his prediction of human-induced climate change; his daring expeditions to the highest peaks of South America and to the anthrax-infected steppes of Siberia; his relationships with iconic figures, including Simón Bolívar and Thomas Jefferson; and the lasting influence of his writings on Darwin, Wordsworth, Goethe, Muir, Thoreau, and many others." I must admit I put this book on my wish list based on the title alone since "Grumpy" could be my middle name—at least that's what my loved ones say. The author, Steve Bender, is Senior Garden Editor at Southern Living Magazine. 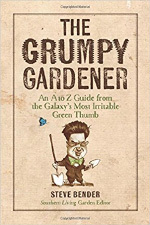 This book contains "the collected wit and wisdom of the magazine's most irreverent and beloved columnist can be found in a single A - Z volume, providing gardeners from coast-to-coast with his valuable tips for planting, troubleshooting, and growing flowers, vegetables, shrubs, trees and more, all delivered in his signature cantankerous style." I can't wait to dig in; I bet I'll be anything but grumpy reading this book. It's a great list, Gerhard. I'm almost embarrassed about how many of these books I already have but I didn't know that Moore had a new book coming out. Thanks for the tip! Kris, I didn't know either that Jeff Moore had a new book. I saw it on his website. Great list Gerhard! I wish you could have attended Andrea Wulf's HPSO talk last year, she's amazing. Looking forward to your review of Private Gardens of the Bay Area. Andrea Wulf: The thing that annoys me more than anything is that Andrea Wulf gave a talk RIGHT HERE in Davis last October but for some reason I wasn't able to make it. I was bummed out then, and I'm still bummed. Oh, I think I heard Vicki Blachman extolling the virtues of Founding Gardeners at the Fling this past summer, so I'm glad now to have the full name and author to check it out. Would it work as a Kindle book, or does it have lots of pictures? I usually prefer to get gardening books in hardback rather than Kindle form because of all the photography, but with its emphasis on history I thought maybe Kindle would work. Alison, Founding Gardeners has very few illustrations so reading it on a Kindle would be just fine. Go to this Amazon page and click on "Look Inside!" to see a preview of both the Kindle version and the regular printed version. Great post Gerhard! I have a few of these myself. They are all wonderful authors and the books make for great reading over the colder months. There's always time for planning! Good point! Winter is the perfect time to catch up on reading and start making plans for the next year! An excellent list Gerhard and there are a few here I still need to get my hands on. This will make a great reference for when I do my next book order.